Provide comfort for the family of Rubye Howell with a meaningful gesture of sympathy. Rubye Wanda Sarratt Howell, 89, wife of the late David Edwin Howell that passed away on November 12, 2011, died on Tuesday, January 22, 2019 at Apple Westfield Rehab Care after a battle with chronic illness. Born in Gaffeny, South Carolina on May 2, 1929, she was the daughter of the late Marvin Thomas Sarratt and Edith Gertrude Bright. Rubye married David on January 30, 1947. 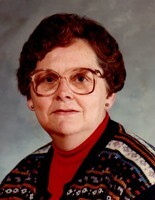 She graduated from Limestone College, Class of 1953 with a bachelor’s degree in Education. In 1957 she and her family move to Connecticut and started teaching third grade at Roger Sherman School until her retirement in 1990. She was a proud member of Calvary Baptist Church in Meriden, taught Sunday school and was on various committees, which she served for many decades. Besides her sister Nellie, she is survived by her daughter Edith, a grandson Chris, a daughter-in-law, Katy and great grandchildren Luke and Abigail. Family and friends are invited to attend calling hours at the John J. Ferry & Sons Funeral Home, 88 East Main St., Meriden on Thursday, January 24, 2019 from 5 to 7 p.m. A funeral service will be held at 7 p.m. Burial will be private. To plant a memorial tree in honor of Rubye Wanda Howell (Sarratt), please visit our Heartfelt Sympathies Store. We encourage you to share your most beloved memories of Rubye here, so that the family and other loved ones can always see it. You can upload cherished photographs, or share your favorite stories, and can even comment on those shared by others.